Leslie, thanks for writing this. I've just graduated from J-school in the U.S. and am about to start my reporting career in China, so your insights were really valuable to me. I'll be looking forward to reading your book. I enjoyed reading your article in National Geographic magazine's China issue. Thanks for telling the story of the Chinese people. Keep up with the good work! This post makes total sense to me. I am also a former journalist, making the transition into the literary world. Once you've stepped away from journalism, especially news reporting, and seen its limits, you can never go back, try as hard as you might. I know exactly what you mean, and was struck as I read The Paris Reviews, by what Hemingway and others said about the limits of journalism. Well done for getting your book finished. You are faster than I. I am still working on mine. It is such a pleasure, though, to create, not regurgitate within the restrictive false-making measures of news. Not to get off track, but this is the only place I could find I(didn't look too hard) to contact you. I just read a book review you did on Outliers. That review was one of the best I've read - ever. Damn, you're a good writer. I have enjoyed your most recent book so much that I checked out a copy of your first(?) book, and ended up buying a copy from Amazon for that book as well. It's wonderful to see that someone is writing about China with insight as well as emotion. I'm grateful that someone can summarize my own jumboed feelings towards China, both the culture and the people, with eloquence and clarity. As someone from Southern Cal (specifically, the one you referred to as the "Chinese suburb"), I'm somewhat mystified that you don't have a book signing tour in our area. It's true that on the whole, we are a cloister bunch, self-statisied in our little home away from home-country kind of way. But I think there are enough 2nd/3rd generation who are interested in the topics you had written about to warrant a stop here. If that's not enough, you do remember we have the most diversified, truly authentic, and just as important, very cheap Chinese food right. From reading "Factory Girls" I never would have thought you had trouble as a journalist or doubted your writing abilities. I absolutely love-love- loved reading the book, and its refreshing to hear accounts your of China from the peoples perspective. Initially I was put off by the introduction, like you said its not something the reader expects in a first page. But the book went on to be an amazing window into the lives of the female migrant workers in China. I wouldn't like it any other way. Keep the good stuff rolling Leslie. You have an amazing voice and perspective. 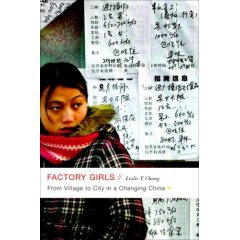 I'm reading _Factory Girls_ right now, getting near the end and very sorry to have to leave that world. Because you have persuaded me how fast and how constantly everything changes in their lives, I've been fretting about the gap in time between when you left Dongguan and the present. By now Min and Chunming and the others must surely have entirely different lives several times over -- and the economic stress going on at the moment must have changed it all again. As a reporter you might still have been in China, telling the story. But as an author of books, are you moved on to another project, and disconnected from the women whose lives you shared? It's a terrific book, and I've been telling everyone about it. Thanks for have done this project. Hi Leslie, I just finish your book, and it's an interesting perspective from the factory girl's point of view on all that is happening in China today. However, I thought there was too much emphasis on your grandfather and his historical importance, and I would have liked to see more on the limited opportunities of rural girls after the Chinese Civil War and on through the turbulant Cultural Revolution. For example, I understand there were many American Chinese men during this time who went back to China and elsewhere to pick wives during this time. The pool of these women are basically from the same pool for factory girls today. I thought a section on the historical interest, longings, and dreams of these women would have been fascinating. Dear Leslie, I also have just finished reading Factory Girls after first learning about it in a NYT book review. Thank you for taking on this project. Through your writing you are taking the American reading public across galaxies of distance in their understanding of modern china. Like another commenter above, I also had difficulty finding information about you on the web. Do you have a website anywhere? I was looking for a page that might link to other things you have written - articles, essays, whatever, but I couldn't find it. It seems to me you are missing a big opportunity not having such a page. I hope to keep following your work in the future. Thanks again. I am really sad when i write your post,it is our world where for for accomplishing of our needs we become machine :( . Leslie, your book was amazing. I absolutely enjoyed every sentence. I read the book in about 4 hours, I could not put it down. I just finished reading your book and I found it thoroughly fascinating. I adopted my daughter from North China in 2005 and am constantly looking for good information about the reality of life in China and this information is not that easy to find. Thank you for giving us a glimpse into the lives that could have easily been my daughter's. Please keep writing. I enjoy reading both yours and your husband's work. Thank you for your work on "Factory Girls." I read the book this week and feel like gained a valuable perspective on the lives of millions of migrant workers in China that would have otherwise taken me years to learn. My family is preparing to move to northern China to live and work in the city of Hohhot, Inner Mongolia this summer. I suppose this is our chuqu.